Long on my wishlist, I was given an opportunity to review Julie Klassen's newest book, The Silent Governess, thanks to CFBA and Bethany House. Olivia Keene is fleeing her own secret. She never intended to overhear his. But now that she has, what is Lord Bradley to do with her? He cannot let her go, for were the truth to get out, he would lose everything--his reputation, his inheritance, his very home. He gives Miss Keene little choice but to accept a post at Brightwell Court, where he can make certain she does not spread what she heard. Keeping an eye on the young woman as she cares for the children, he finds himself drawn to her, even as he struggles against the growing attraction. The clever Miss Keene is definitely hiding something. Moving, mysterious, and romantic, The Silent Governess takes readers inside the intriguing life of a nineteenth-century governess in an English manor house where all is not as it appears. There is just something about Julie’s writing that makes me feel like I am watching a lovely BBC Jane Austen movie. Seeing as the author enjoys BBC period dramas, I am not surprised! The Silent Governess is by no means overly descriptive, in a tiring way, and yet, I could easily picture the clothing, the grounds, the rooms, the village. I love the way Julie quotes different historical sources, such as journals of actual governesses and advertisements in the London Times, at the beginning of each chapter. These little tidbits give a fascinating look into Regency times and behaviors, as well as making the whole book utterly charming. I found The Silent Governess to be a delightful read. I look forward to other stories that Julie Klassen will create! The day began wonderfully well. My mother, father, and I, then twelve, rode into Chedworth together and spent a rare afternoon as a harmonious family. We viewed many fine prospects and toured the Roman ruins, where my mother met by chance an old friend. I thought it a lovely outing and remember feeling as happy as I had ever been—for my mother and father seemed happy together as well. The mood during the journey home was strained, but I chalked it up to fatigue and soon fell asleep in the gig, my head lolling against my mother's shoulder. When we arrived home, I remained in such buoyant spirits that when my father dully proclaimed himself off to the Crown and Crow, I offered to go along, although I had not done so in many months. He muttered, "Suit yourself," and turned without another word. I could not account for his sudden change of mood, but then, when had I ever? I had been going with him to the Crown and Crow since I was a child of three or four. He would set me upon its high counter, and there I would count to a thousand or more. When one has mastered one hundred, are not two, five, and nine so much child's play? By the age of six, I was ciphering sums to the amusement and amazement of other patrons. Papa would present two or three figures and there before me, as if on a glass slate, I would see the totals of their columns. "What is forty-seven and fifty-five, Olivia?" Instantly the numbers and their sum would appear. "One zero two, Papa." "One hundred two. That is right. That's my clever girl." As I grew older, the equations grew more difficult, and I began to wonder if the weary travelers and foxed old men would even know if I had ciphered correctly. But my father did, I was certain, for he was nearly as quick with numbers as I. He also took me with him to the race clubs—even once to the Bibury Racecourse—where he placed wagers entrusted to him by men from Lower Coberly all the way to Foxcote. Beside him, with his black book in my small hands, I noted the odds, the wins and losses, mentally subtracting my father's share before inscribing the payouts. I found myself caught up in the excitement of the race, the smells of meat pasties and spiced cider, the crowds, the shouts of triumph or defeat, and the longed-for father-daughter bond. Mother had always disliked my going with Papa to the races and public house, yet I was loath to refuse him altogether, for I was hungry for his approval. When I began attending Miss Cresswell's School for Girls, however, I went less often. In the Crown and Crow that day, being twelve years of age, I was too old to perch upon the high counter. Instead I sat beside my father in the inglenook before the great hearth and drank my ginger beer while he downed ale after ale. The regulars seemed to sense his foul temper and did not disturb us. Then they came in—a well-dressed gentleman and his son, wearing the blue coat and banded straw hat of a schoolboy. The man was obviously a gentleman of quality, perhaps even a nobleman, and we all sat up the straighter in defense of our humble establishment. The boy, within a year or two of my own age, glanced at me. Of course we would notice one another, being the only young people in the room. His look communicated disinterest and contempt, or at least that was how I ciphered his expression. The gentleman greeted the patrons in gregarious tones and announced that they had just visited a lord somebody or other, and were now traveling back toward London to return his son to Harrow's hallowed halls. My father, cheeks flushed and eyes suddenly bright, turned to regard the boastful gentleman. "A Harrow lad, ey?" "Just so," the gentleman answered. "Like his old man before him." "A fine, clever lad, is he?" Papa asked. A flicker of hesitation crossed the gentleman's face. "Of course he is." "Not one to be outwitted by a village girl like this, then?" Papa dipped his head toward me, and my heart began to pound. A sickening dread filled my stomach. The gentleman flicked a look at me. "I should say not." Father grinned. "Care to place a friendly wager on it?" This was nothing new. Over the years, many of the regulars had made small wagers on my ability to solve difficult equations. And even fellows who lost would applaud and buy Papa ale and me ginger beer. The gentleman's mouth twisted. "A wager on what?" "That the girl can best your boy in arithmetic? They do teach arithmetic at Harrow, I trust?" "Of course they do, man. It is the best school in the country. In the world." "No doubt you are right. Still, the girl here is clever. Is she not, folks?" Papa turned to the regulars around the room for support. "Attends Miss Cresswell's School for Girls." "Miss Cresswell's?" The gentleman's sarcasm sent shivers down my spine. "My, my, Herbert, we had better declare defeat before we begin." My father somehow retained control of his temper. Even feigned a shrug of nonchalance. "Might make for a diverting contest." The gentleman eyed him, glass midway to his lips. "What do you propose?" "Nothing out of the ordinary. Sums, divisions, multiplications. First correct answer wins. Best of three?" That was when I saw it—the boy's look of studied indifference, of confidence, fell utterly away. In its place pulsed pale, sickly fear. The gentleman glanced at his son, then finished his drink. "I don't find such sport amusing, my good man. Besides, we must be on our way. Long journey ahead." He placed his glass and a gold guinea on the counter. "I don't blame you," Papa rose and placed his own guinea on the bar. "A bitter pill, bein' bested by a girl." "Pu-ppa ..." I whispered. "Don't." "Well, Herbert, we cannot have that, can we." The gentleman poked his son's shoulder with his walking stick. "What do you say, for the honour of Harrow and the family name?" And in the stunned dread with which son regarded father, I saw the rest. I recognized the fear of disappointing a critical parent, the boy's eagerness for any morsel of approbation, and his absolute terror of the proposed contest. Clearly he was no scholar in mathematics, a fact he had perhaps tried desperately to conceal— and which was now about to be exposed in a very public and very mortifying manner. "Excellent," my father said. "Ten guineas to the winner?" "Per equation? Excellent," the gentleman parroted shrewdly. "Thirty guineas total. Even I am skilled in ciphering, you see." I swallowed. My father had not meant thirty guineas. Did not have thirty guineas, as the gentleman must have known. My father did not so much as blink. "Very well. We shall start out easy, shall we? First with the correct answer wins." He enunciated two three-digit numbers, and the sum was instantly before me and out of my lips before conscious thought could curtail it. I glanced at Herbert. A trickle of sweat rolled languidly from his hairline to his cheek. "Come, Herbert, there is no need to act the gentleman in this instance. You may dispense with ‘ladies first' this time, ey?" Herbert nodded, his eyes focused on my father's mouth as though willing the next numbers to be simple ones, as though to control them with his stare. Papa gave a division problem, not too difficult, and again the answer painted the air before me. And again the young man did not speak. Go on, I silently urged. Answer. "Come, Herbert," his father prodded, features pinched. "We haven't all night." "Would you mind repeating the numbers, sir?" Herbert asked weakly, and my heart ached for him. I felt my father's pointed look and heard his low prompting, "Out with it, girl." "Six hundred forty-four," I said apologetically, avoiding the gazes of all. Murmurs of approval filled the room. The gentleman stood, eyes flashing. "There is no way the girl could figure that in her head. I see what this is. A trick, is it not? No doubt we are not the first travelers to be taken in by your trained monkey who has memorized your every equation." I cringed, waiting for my father to rise, fists first, and strike the man. Cheaters infuriated him, and many was the time I'd seen him fly into a rage over a thrown game or race. Yes, he'd take his share of other men's winnings, but not a farthing more. "Let us see how she fares if I propose the question," the gentleman demanded. "And the first correct answer wins the entire wager." Would my father abide such an insulting insinuation? The proprietor laid a hand on his arm, no doubt fearing for the preservation of his property. "Why not, man?" he quietly urged. "Let Olivia prove herself the clever girl we all know she is." "Unless you are afraid?" the gentleman taunted. My father's eyes bore into the face of the proud traveler, while I could not tear mine from the son's. Such humiliation and shame were written there. It was one thing for a girl to be clever—it was unexpected. A parlor trick, however honestly come by. But for a son, his father's pride, and no doubt heir, to be proven slow, to be made a fool by a girl? I shuddered at the thought of the piercing reprimands or cold rejection that would accompany him on the long journey ahead. And perhaps for the rest of his life. The gentleman eyed the hop-boughed beams as he thought, then announced his equation. No doubt one he knew the answer to, likely his acreage multiplied by last year's average yield. Something like it, at any rate. Against the background of the boy's pale face and bleak green eyes, the numbers appeared before me, but lacked their usual clarity. Instead they swayed and slithered like that old silverfish and slid beneath the door. The young man's eyes lit up. He had likely hit upon the number by memory rather than calculation, but as soon as he proclaimed the answer, I knew he was correct. The relief and near-jubilation on his face buoyed me up for one second. The answering smile and shoulder-clap from his father, one second more. Then the disapproval emanating from my own father's eyes pulled me around, and I saw the terrible truth of what I had done. Too late, I saw. Never again would he take me with him. Never again would he call me his clever girl, nor even Olivia. The gentleman picked up my father's guinea from the bar. "I will take only one guinea, and let that be a lesson to you. I shall leave the rest to cover your debts to the others you have no doubt tricked over the years." Turning with a flourish, the gentleman placed a gloved hand on his boy's shoulder and propelled him from the room. I watched them go, too sickened to be relieved that all I had cost my father was one guinea. For I knew I had cost him far more—the respect of every person in that room. Slowly I became aware of their hooded looks, their unconscious shrinking back from us. Now they would believe the traveler's accusation that my ability had been a trick all along. All their applause and ale and wagers accepted dishonestly. In his eyes—in theirs— they had all been made fools by us. By me. It is nought good a slepyng hound to wake. H eart pounding with fear and regret, Olivia Keene ran as though hellhounds were on her heels. As though her very life depended upon her escape. Fleeing the village, she ran across a meadow, bolted over the sheep gate, caught her skirt, and went sprawling in the mire. The bundle in her cape pocket jabbed against her hip bone. Ignoring it, she picked herself up and ran on, looking behind to make sure no one followed. Ahead lay Chedworth Wood. The warnings of years echoed through her mind. "Don't stray into the wood at night." Wild dogs stalked that wood, and thieves and poachers camped there, with sharp knives and sharper eyes, looking for easy game. A woman of Olivia's four-and-twenty years knew better than to venture into the wood alone. But her mother's cries still pulsed in her ears, drowning out the old voice of caution. The danger behind her was more real than any imagined danger ahead. Shivers of fear prickling over her skin, she hurled herself into the outstretched arms of the wood, already dim and shadowy on the chill autumn evening. Beneath her thin soles, dry leaves crackled. Branches grabbed at her like gnarled hands. She stumbled over fallen limbs and underbrush, every snapping twig reminding her that a pursuer might be just behind, just out of sight. Olivia ran until her side ached. Breathing hard, she slowed her pace. She walked for what seemed like an hour or more and still hadn't reached the other side of the wood. Was she traveling in a circle? The thought of spending the night in the quickly darkening wood made her pick up her pace once more. She tripped on a tangle of roots and again went sprawling. She heard the crisp rip of fabric. A burning scratch seared her cheek. For a moment she lay as she was, trying to catch her breath. The pain of the fall broke through the dam of shock, and the hot tears she had been holding back poured forth. She struggled up and sat against a tree, sobbing. Almighty God, what have I done? A branch snapped and an owl screeched a warning to his mate. Fear instantly stifled her sobs. Hairs prickling at the back of her neck, Olivia searched the moonlit dimness with wide eyes. A dog, wiry and dark, stood not twenty feet away, teeth bared. In silent panic, Olivia scratched the ground around her, searching for something to use as a weapon. The undergrowth shook and the ground pulsed with a galloping tread. Two more dogs ran past, one clenching something round and white in its jaws. The head of a sheep? Olivia thrust aside the memory of its cold, hard weight. She listened for several tense seconds. Hearing nothing more, she rose, stick firmly in hand, and hurried through the wood, hoping the dogs wouldn't follow her trail. The moon was high above the treetops when she saw it. The light of a fire ahead. Relief. Wild animals were afraid of fire, were they not? She tentatively moved nearer. She had no intention of joining whoever had camped there—perhaps a family of gypsies or a gentlemen's hunting party. Even if the rumors of thieves and poachers were stuff and nonsense, she would not risk making her presence known. But she longed for the safety the fire represented. She longed, too, for its warmth, for the November night air stole mercilessly through her cape and gown. Perhaps if another woman were present, Olivia might ask to warm herself. She dared move a little closer, stood behind a tree and peered around it. She saw a firelit clearing and four figures huddled around the flames in various postures of repose. The sound of men talking and jesting reached her. "Squirrel again tonight, Garbie?" a gravelly voice demanded. "Unless Croome comes back with more game." "This time o' night? Not dashed likely." "More likely he's lyin' foxed in the Brown Dog, restin' his head on Molly's soft pillows." "Not Croome," another said. "Never knew such a monkish man." Every instinct told Olivia to flee even as she froze where she stood. This was no family, nor any party of gentlemen. Fear slithering up her spine, she turned and stepped away from the tree. A young man's loud whisper stopped Olivia's retreat. She stood still, afraid to make another sound. "What's what? I don't hear nofin'." Olivia took a tentative tiptoe step. Then another. A sticky web coated her face, startling her, and she stumbled over a log onto the ground. Before she could right herself, the sound of footsteps surrounded her and harsh lamplight blinded her. "Well, kiss my bonnie luck star," a young man breathed. Olivia struggled to her feet and pushed down her skirts. She brushed her fallen hair from her face and tried to remain calm. "Croome's got a mite prettier since we saw 'im last," said a second young man. Beside him, a bearded hulk glowered down at her. In the harsh, gravelly voice she had first heard, he demanded, "What are ya doin' here?" Panic shot through her veins. "Na—nothing! I saw your fire and I—"
"Looking for some company, were ya?" The big man's leer chilled her to the marrow. "Well, ya come to the right place— hasn't she, lads?" The big man reached for her, but Olivia recoiled. "No, you misunderstand me," she said. "I simply lost my way. I don't want—"
"Oh, but we do want." His gleaming eyes were very like those of the wild dog. The stout stick she had been carrying was on the ground, where it had landed when she fell. She lunged for it, but the man grabbed her from behind. "Where d'ya think yer going? Nowhere soon, I'd wager." Olivia cried out, but did manage to get her hand around the stick as he hauled her up. The burly man laughed. Olivia spun in his arms and swung the stick like a club. With a thwack, it caught the side of his head. He yelled and covered the wound with his hands. Olivia scrambled away, but two other men grabbed her arms and legs, wrestled the stick from her, and bore her back to the fire. "You all right, Borcher?" the youngest man asked, voice high. "I will be. Which is more'n I can say for her." "Please!" Olivia implored the men who held her. "Release me, I beg of you. I am a decent girl from Withington." "My brother lives near there," the youngest man offered. "Shut up, Garbie," Borcher ordered. "Perhaps I have met your brother," she said desperately. "What is his na—?" "Shut yer trap!" Borcher charged forward, hand raised. "Borcher, don't," young Garbie urged. "Let her go." "After the hoyden hit me? Not likely." Borcher grabbed her roughly, pinning both arms to her sides with one long, heavy arm and pressing her back against a tree. She tried in vain to stomp on his foot, but her kid slippers were futile against his boots. "No!" she shouted. "Someone help me. Please!" His free hand flashed up and clasped her jaw, steely fingers clamping her cheeks in a vise that stilled her shouts. She wrenched her head to the side and bit down on his thumb as hard as she could. Borcher yelled, yanked his hand away, and raised it in a menacing fist. Olivia winced her eyes shut, bracing herself for the inevitable blow. Fwwt. Smack. Something whizzed by her captor's ear and shuddered into the tree above her. She opened her eyes as Borcher whirled his head around. Across the clearing, at the edge of the firelight, a man stood atop a tree stump, bow and arrow poised. "Let her go, Phineas," the man drawled in an irritated voice. "Mind yer own affairs, Croome." Borcher raised his fist again. Another arrow whooshed by, slicing into the tree bark with a crack. "Next time, I shall aim," the man called Croome said dryly. Though he appeared a slight, older man, cool authority steeled his words. Borcher released Olivia with a hard shove. The back of her head hit the tree, where long arrows still quivered above her. Even the jarring pain in her skull did not diminish the relief washing over her. In the flickering firelight, she looked again at her rescuer, still perched on the stump. He was a gaunt man of some sixty years in a worn hat and hunting coat. Ash grey hair hung down to his shoulders. A game bag was slung over one of them. The bow he held seemed a natural extension of his arm. "Thank you, sir," she said. Glimpsing the stout stick by the light of the forgotten lamp, Olivia bent to retrieve it. Then turned to make her escape. "Wait." Croome's voice was rough but not threatening. He stepped down from the stump, and she waited as he approached. His height—tall for a man of his years—and limping gait surprised her. "Take the provisions I brought for these undeserving curs." She accepted a quarter loaf of bread and a sack of apples. Her stomach rumbled on cue. But when he extended a limp hare from his game bag, she shook her head. "Thank you, no. This is more than enough." One wiry eyebrow rose. "To make up for what they did to you—and would have done?" Olivia stiffened. She shook her head and said with quiet dignity, "No, sir. I am afraid not." She handed back the bread and apples, turned, and strode smartly from the clearing. His raspy chuckle followed her. "Fool ..."
And she was not certain if he spoke of her or of himself. Olivia walked quickly away by the moonlight filtering through the autumn-bare branches, the stick outstretched before her like a blindman's cane. She stayed alert for any hint of being followed but heard nothing save the occasional to-wooo of a tawny owl or the feathery scurrying of small nocturnal creatures. Eventually her fear faded into exhaustion and hunger. Perhaps I should not have been so proud, she thought, her stomach chastising her with a persistent ache. Finally, unable to trudge along any further, she curled into a ball beside a tree. She searched her cape pockets for her gloves, but only one remained—the other lost in the wood, no doubt. She again felt the firm bundle in her pocket but did not bother to examine it in the dark. Shivering, she drew her hooded cape close around herself and covered her thin slippers with handfuls of leaves and pine needles for warmth. Images of her mother's terrified eyes and of a man's body lying facedown on the dark floor tried to reassert themselves, but she pushed them away, escaping into the sweet forgetfulness of sleep. 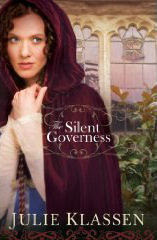 Many thanks to Julie, through CFBA, for allowing me to read and review The Silent Governess! Another book I can't wait to read. At least this one is sitting in my TBR piles, just waiting to be read/reviewed. General Mills Cereal - WIN a free box! Skin MD Natural - Review and Giveaway!